Despite representing an essential constituency for peace, women continue to be marginalised and excluded from peace processes in the Arab region, a meeting of Dutch MPs was told earlier this week. 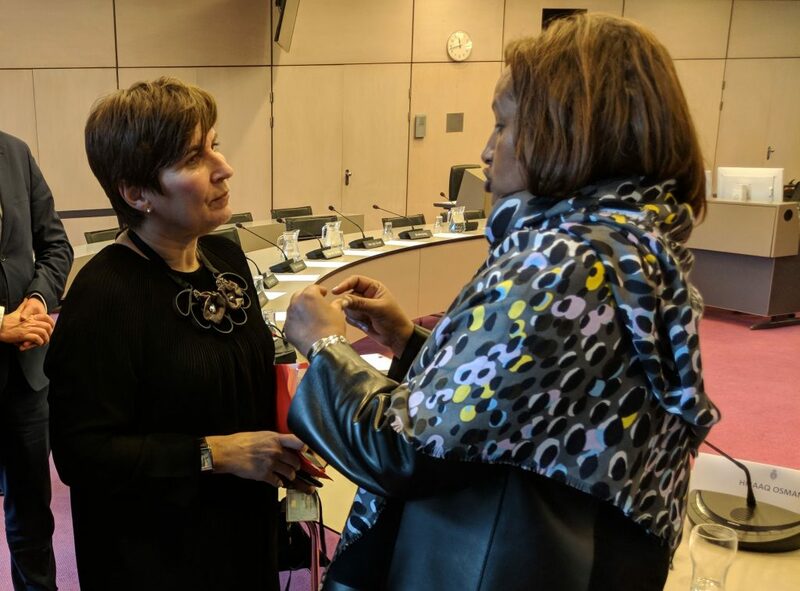 Members of the foreign affairs committee invited women’s rights activists from Iraq, Libya and Yemen to The Hague to discuss the impact of conflict and instability. The committee was also keen to understand how the Netherlands could have a positive impact as a member of the UN Security Council. Opening the discussion, Hibaaq Osman of Karama noted that this was a rare opportunity for civil society activists to have their voices heard. Human rights defenders – and in particular women’s rights activists – face mounting barriers in their work on the ground, and have very few chances on the global stage to discuss issues as they affect the community. Osman said that it was vital that civil society had a place at the table during key discussions, from the national level to the Security Council. This was an area the Netherlands could use its influence, she said. Suzan Aref, of the Women’s Empowerment Organisation, noted that women in Iraq have suffered greatly in the recent conflict, and now face further threats from discriminatory laws. Iraqi politicians had recently been discussing the imposition of the Ja’fari law, which would have legalised practices such as early marriage and polygamy, and seriously turned the clock back on the cause of women’s rights. Iraq had made important steps forward through the agreement of its National Action Plan for the implementation of UNSCR 1325, Aref noted. The plan affirms that peace is best achieved when men and women are equal partners in resolving conflict and investing in stability. However, the plan requires proper funding and political will to ensure that it actually benefits women. Amal Basha of the Sisters Arab Forum for Human Rights outlined the shocking situation in Yemen: 26 million people facing the daily threat of airstrikes and civilians making up 80 percent of bombing casualties, 2.5 million displaced, and a country facing starvation and disease. In praising the recent efforts of the Dutch and Canadian governments in demanding an independent, international investigation into the conflict in Yemen, Basha decried the politicisation of the Human Rights Council. War crimes and human rights violations should be the subject of investigation, not negotiation, Basha said. Zahra’ Langhi opened by showing a clip from the Libyan Women’s Platform for Peace documentary on the continuing threat of landmines in Benghazi. Landmines are just one example of the lingering physical and mental trauma of war that Libyans need to deal with in order to achieve peace. Langhi said that efforts to establish democracy in Libya had been hamstrung by the failure to prioritise security, accountability, and demilitarization. Attempts to support women’s participation had been particularly affected by this, with Langhi noting that “in order to empower women, you must dis-empower warlords”. Justice and security are essential to peace in Libya. The meeting was attended by number of influential MPs, including former development minister Lilianne Ploumen, as well as Han ten Broeke, Martijn van Helvert, Sjoerd Wiemer Sjoerdsma, Kathalijne Buitenweg and Kees van der Staaij. In addition to the hearing with the committee, the delegates also met with a number of key figures while in the Netherlands. They were welcomed to the parliament by speaker of the house of representatives Khadija Arib, and also discussed the particular difficulties they faced as women activists. The activists also met with the Dutch Ministry of Foreign Affairs, discussing their work and trying to understand the foreign policy priorities for the government.